£20 – £30 for 2kg paste + 50g tube of hardener. Bit of a stupid statement really. I suppose the only way I can give background is on the choice I made. I long time ago I had an old Audi 100 Avant (early ’80s), that went rusty on the aerial mount on the front wing. I purchased the Isopon P38 mix. Again it was mix it up and fill it up job. Yeah it worked but the rust came back trough the filler and sort of fell out the hole along with the rest of that part of the wing. Yes I did use rust treatment, Halfrauds own version, it was rotten as the wing and didn’t work obviously. I swore never to use Isopon again. I was looking on the net and there is much talk of the wing in a tin, Bondo. I have tried to get it here in the UK, without success and keep being pointed to the over priced Isopon. I use Frost for my restoration products and they had a few fillers on there. Dinitrol 6030 Metalised Body Filler (it will just be called Dinitrol going forward, I really can’t keep typin’ that little lot out). I spoke to Frost and they assured me it was good. I looked everywhere for reviews and nothing. So I decided to bite the bullitt and get some, was it any good? There was no box, just the what it came in, a box with a lot of other stuff. There was the tin and there was the hardener shrink wrapped together. The size I got was the 2kg tin, I’m not sure if there are other sizes, but I reckon I will need this little lot for a start. Price, yeah it’s quite expensive but on a similar cost to P38. Now the book of words (or instructions) for this are impressive, it’s a two-part polyester vacuum processed product. What that means is it should be smooth and no pores (air pockets). Opening the tin will great your nose with that classic epoxy resin smell. Next was the colour, I say that because I was not sure what to expect, it was silver in colour. I expect the high levels of aluminium in the past had something to do with it! The surface had a little oil separation which was soon sorted out by the stirring of the paste until it had all gone. The consistency of the past is fairly thick, but not thick enough to support the applicator on its own when there is a little amount in the mixing tray. I use old take out plastic trays which are perfect for the job. I have used this one before and it still has the old batch of filler stuck to the bottom of the plastic. Now this tray was non treated and shiny. The relevance being that I tried to crack it off the plastic to get a clean surface. That were not happening! I tried with a pallet knife, same, I couldn’t get it off. This made me smile as things were looking good from about two months ago where I used it on the headlight buckets. I purchased a set of three spreaders or applicators to use. The tiny ones are useless and give an uneven spread on larger surfaces. Treat yourself to a decent set. mix tray – not the old filler that i tried to get off! It was stuck solid on the bottom. Take out an approximate amount of the paste required into the tray, and seal the tin back up. Next take the hardener and apply a small amount to the paste approx 2%. Not enough and it will take days to dry and remain sticky and clog the sander up. Too much and you have about two minutes to use it. The correct amount will give you six or seven minutes of mixed tub life to spread it. The hardener is bright pink to go with the silver paste. Any more colours and Andy Warhol could create the next best thing! Mixing in the paste still stays as silver. It does not change consistency at all. It just feels right like how a good paste should be, if that makes sense. Now get this: according to the book of words (instruction guide), this filler is able to fill cracks or dents to a depth of 10mm in vertical panels. Now if you have a dent that bad you should be banging it out to start with. Lifting the paste out does not drip or string away from the applicator. Placing it on the surface you are able to spread it with incredible precision. You can make it as thick as you like, or as thin as you like. There are no bubbles to burst, just a nice smooth creamy feel to it. You would think that with all the aluminium in their that it would be granular, but it’s honestly not, the eyes deceive you. I have gone a little over board with the application on the pictures here as I am also doing this as part of my Bumper Stone guard work which can be found here. The reason for the mess is to show how it works on the sanding and the results. When you sand this stuff down it is so easy. The sander will touch the filler and it goes away to an ultra fine white powder. This will sit in any low spots and show you where they are. If they are to low leave and apply a second coat. But, if you get this right, you only need to apply lot. Am I mad to say that? Nope, look at how I layered the filler on, just to prove the point I didn’t spread it out to well either. You can get it ULTRA fine while spreading, so fine you can see through it as the picture shows. They say you can start sanding after twenty minutes in ideal conditions. I left mine overnight in the utility room and sanded the next day. Perfect results. 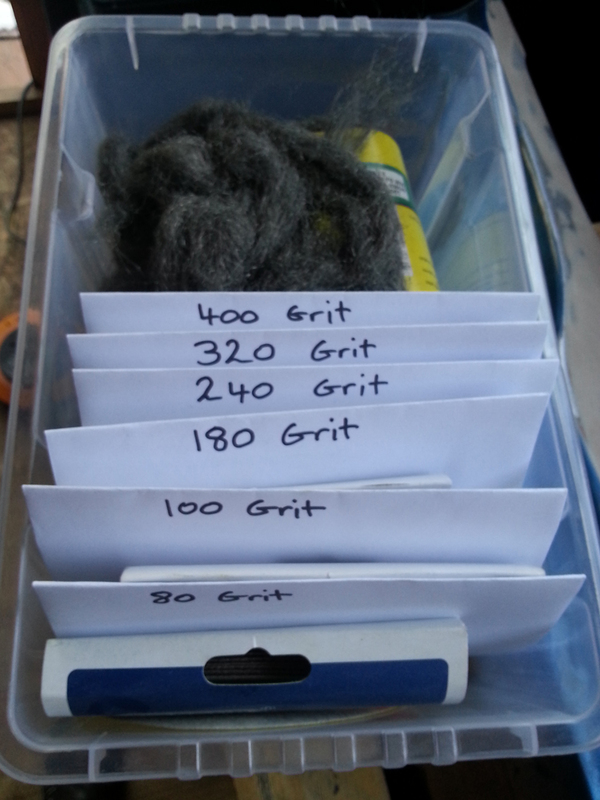 The sanding started with the 180g (grit), and done a quick run over the worst parts. It soon took it down to a workable level.Tip: The powder does tend to be so fine it will sit on the disks and fill them up. I use an old wire brush just to brush the build up off, which comes of real easy and then I start again. The filler does not eat away at the discs and a constant changing of discs is not required. I then went up to the 240g and then the 320g. At this point running your fingers across the surface and it feels like glass. I mean its smooth. Yes there was a bit of bare metal exposed and there was a depth of filler. This is to level it all out. I got that result in about an hour! How can you measure the results? Does it fall out or crack? Does it shrink? Does it sand? The filler does not shrink, It does not crack and it sands smooth. I mean real smooth. The fact that it feels like glass and that is with only the 320g must say something. I have 400g to use as well but I didn’t need it. I will use that on rubbing down the high fill primer. I mentioned that I could not get the previous use of filler of the bottom of the tray from plastic. I twisted it, bent it and chiseled it with a spreading knife, it stayed on. Under normal circumstances I don’t expect this stuff to crack peel or fall out. I have used it previously on my headlight buckets and they stayed in the shed over the -16deg we recently had weather wise. They are still as good as the day I put the filler in. I love this stuff, I would serious recommend that if you want a quality filler, this will not let you down. What di it look like with the primer? Like new, thats what I looked like!